The Lodge is pleased to present Good Luck by Robbie Simon, his second solo exhibition in Los Angeles. 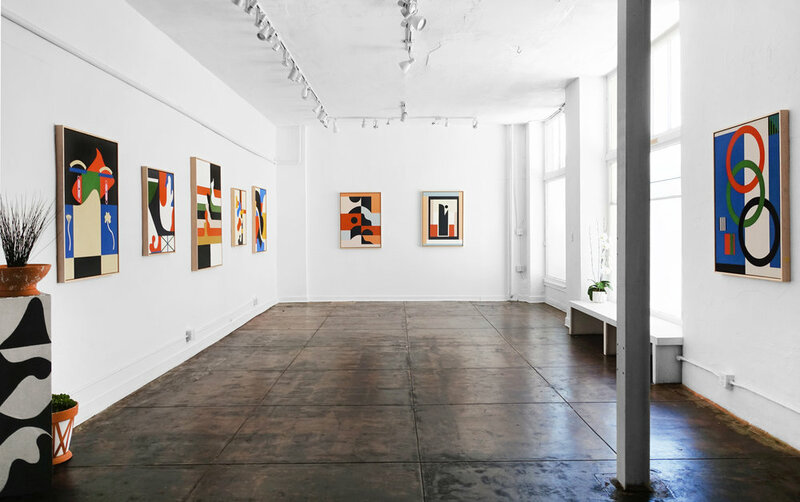 The exhibition features selections of work revolving around flat abstract graphic compositions that resist simple interpretation or functionality. The work is often powered by bright and unique color palettes inviting the viewer to consider the mindfully crafted juxtapositions that can drift between finessed mirages of figurative concepts and jovial 2-D sculptural graphics. Robbie Simon (b. 1984) is an artist and designer working in Los Angeles, CA. Simon's career has its most notable origins in the music world where he's worked with artists such as Allah Las, Kevin Morby, Wilco, Bonnie "Prince" Billy, Fleet Foxes, Grizzly Bear, Sharon Van Etten, SURVIVE, Tinariwen, Max Richter, Django Django among many others. His work has crossed over to a wide variety of paths and clients including Stussy, Standard Hotel, Vans, Barbican Centre London, Pitchfork Music and Afar Magazine to name a few.